It’s been two years since we’ve heard a new album from our favorite pop/alt band, OneRepublic. Lead singer, Ryan Tedder recently told Zane Lowe at Beats 1 it was definitely time for them to release some new music. “If we had to compile an album this week we could do it, but I’m kind of insatiable, so I’ll be writing up until probably September” he says. The first single, “Connection” is another pop-infused alt anthem focusing on how hard it is to find genuine people in a world filled with false hope. Featuring a chanty chorus (“can I get a connection?”) and Tedder’s evergreen voice. Once again, he can do no wrong and I’m convinced this band will last forever. As for more details on the album, the Oklahoma native says he’s trying to grab Mark Foster, Paul McCartney (yes, you read that right), THEY., and many others for possible collaborations and hoping we’ll see the album by the fall. To see OneRepublic on tour, buy tickets here! July 14, 2017 by Blondie and the BeatLeave a Comment on NMF Picks! Oh My My, is the title of their latest album since their 2013 release, Native. A 16-song tracklist reminds fans just how unstoppable they are. One Republic feels like an old friend, that you’ve had most of your life. You love them dearly, they are always there for you, and whenever you start to forget or lose touch with them they come right back into your life again, for the better. They make you a better person and an even bigger fan. This album takes a slight turn down a path we’ve never heard from this talented group. Pulling influences from electronic leaders like M83 and Miike Snow, the boys pull back from their usual rock-alt/pop sound. While listening to the album you find yourself getting lost in it (like you would any other 1R album) but this time the music is more rich and unique. The songs are heavier while the lyrical quality remains as One Republic as ever; beautiful, poetic, and slightly cliche. Lead singer, Ryan Tedder talked about the album as a whole to officialcharts.com saying, “It’s a very diverse album, but when you start hearing some of these songs, the humanity is there – that’s what took so damn long to make it.” Songs like, “Kids,” “Future Looks Good,” and “Wherever I Go” sound like the band we know and love. Catchy choruses and a thudding array of instruments float through each verse in the most cohesive way. While “Oh My My,” “NbHD,” and “A.I.” make you realize that this band CAN succeed at electronic music. They keep a gentle balance between overboard and juuuust right. Each one still feels like it could be stripped down and played in a coffee shop. The instrumentation is still present, even though the sound has shifted. Tedder’s voice motivates you on “Future Looks Good”, singing “you are, you are the future, and the future looks good.” Which is something he’s been good at; writing lyrics with meaning that most artists can’t do their whole careers. One Republic have kept a close grasp on why they are a band in the first place; for the music. “Born” is one of the best off the album. A song bound to be played at many future weddings (only if they have good music taste, like me.) The lyrics make you wish you were in love; “Yeah found someone to keep my head up, yeah trading darkness for the dawn, I was born, born to love you.” The chorus is so angelic, it feels as close to heaven as you’ll ever get here on Earth. In a world full of so much disagreement and hate, One Republic manages to sprinkle our souls with pure appreciation and love. One Republic have once again shot themselves to the top of my list. Just when you think they can’t get any better, they do. Notorious for giving you a big warm hug and reminding you that life is beautiful. One Republic lights it up! August 12, 2014 August 13, 2014 by Blondie and the BeatLeave a Comment on One Republic lights it up! First of all let me apologize for my absence in the blog world… I have been busy working two jobs and trying to get myself prepared to head back to college. Who knew summer would be so busy?? Despite my packed summer, this past weekend I had the wonderful opportunity to finally see One Republic live in concert! Last year around the same time my family and I had tickets to see them and the show got cancelled. We saw the opening band and everything, then One Republic came on stage (minus Ryan Tedder) and apologized for their cancellation. It was my birthday present…I was crushed. So this year, we made it happen! My dreams came true and I could not have been happier. The Native Summer Tour is NOT one to miss. With two noteworthy opening bands (The Script and American Authors) this was a fantastic night. Although “Best Day of My Life” is probably the most annoying song on the planet, I did enjoy American Authors’ performance. They had a lot of energy and managed to hype everyone up for The Script and most of all, One Republic. Then came The Script. They completely warmed my heart. I have loved this band for a long time and have always wanted to see them live. So opening for One Republic was the whipped cream on top of a beautiful birthday celebration. The lead singer, Danny, made every fan feel special. My favorite song they performed would have to be “For the First Time” there is something purely beautiful about it. The piano and the lyrics really make it a true anthem. Another fun moment was when Danny told the crowd to call an ex boyfriend/girlfriend so they could sing “Nothing” to them. One woman in the front called her ex-boyfriend and handed Danny her phone. He stayed on the line the entire time as Danny sang “Nothing” into the phone, it was actually hilarious!! After the song he had the entire crowd yell “Goodbye A**h***!” as he hung up the phone. It was one of the coolest things I’ve ever seen. Overall, I was ecstatic at The Script’s performance. They really blew me away. I would absolutely see them again, probably as a headliner. After a long extraneous wait for One Republic, they finally began the show! 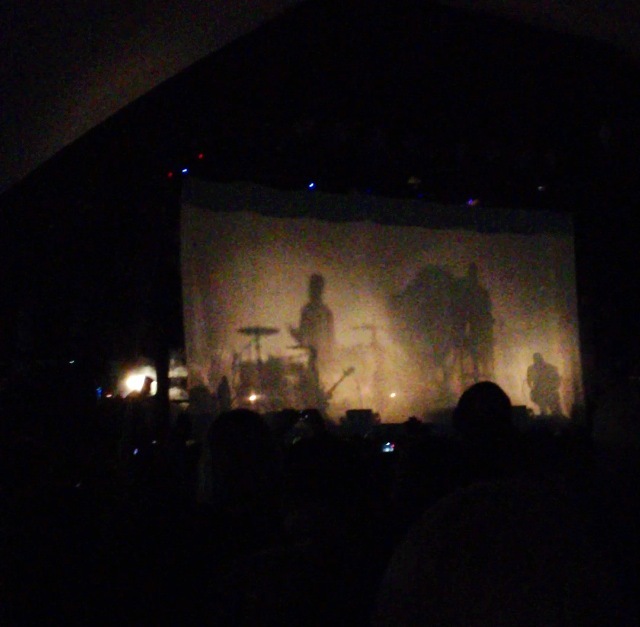 The stage had a curtain blocking the band as they started to play “Don’t Look Down” and then directly into “Light It Up” both from their newest album “Native”. The tan-ish curtain showed the crowd the trippy moving shadows of each band member as they continued playing “Light It Up”. Near the end of the song the curtain finally dropped, displaying gorgeous lights, an eclectic backdrop and none other than a dancing Ryan Tedder swirling around the stage to his own voice. Every song was even better then what you would hear in your car on a late night emotional drive. “Can’t Stop” – The bass makes your heart beat out of your chest and Ryan’s falsetto is to die for. “Come Home” – One of my favorite songs of all time, I have been waiting my whole life to hear it live. “Apologize” – The slowed down piano version Ryan sang with strings in the back served a serious amount of emotion, not to mention he tacked on Sam Smith’s “Stay With Me” flawlessly at the end of the song making it seem like the two were meant to be sung together. “If I Lose Myself” – In my mind this was One Republic’s ‘comeback song’ and is spectacular live. The band decided to perform the Alesso remix which got the crowd up and dancing on their feet. This was the perfect encore. The entire band looked like they were having a blast together, each member putting their heart and soul into every song. There’s no denying that Ryan steals the spotlight considering he can play piano, guitar, tambourine, and probably every other instrument on the planet, but each member is just as talented and deserves to shine on that stage. Overall this band lives for music and it is clearly evident in the shows they give. Ryan Tedder made a promise that the next time they see us they will have new music, new clothes, and will hopefully be better looking… no worries, they look just as good right now! The stage lights were gorgeous!